Watch Out: Apple Patent Hints At Something For Your Wrist : All Tech Considered The rumor mill has been churning out speculation about what's next from Apple. The latest fodder comes from the Apple Insider blog, which found an Apple patent filing pointing to a smart watch with a flexible touchscreen display. 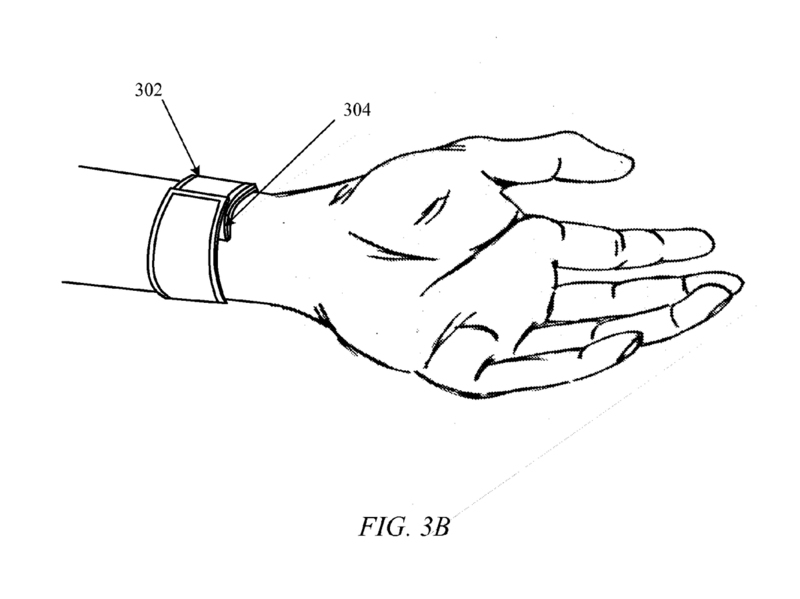 A drawing from Apple's patent application could give clues to the rumored iWatch device. The rumor mill has been churning out speculation about what's next from Apple. The latest fodder comes from the Apple Insider blog, which found an Apple patent filing pointing to a smart watch with a flexible touchscreen display. So it seems Apple is throwing the traditional watch look out the window and bringing back the slap bracelet. Apple filed an application for a "Bi-stable spring with flexible display" with the U.S. Patent and Trademark Office in August 2011. The application describes a design that has a flexible display with a strap made of a bi-stable spring made of thin steel. When worn, the watch's "on-board sensors, like gyroscopes and accelerometers, would aid in orienting the screen's information toward the user," Apple Insider noted. This information still leaves a lot of room for further designing and determining the watch's capabilities. According to Bloomberg, 100 product designers are working on the new watch, which many Apple watchers have dubbed the iWatch. "The team's size suggests Apple is beyond the experimentation phase in its development," Bloomberg said. Other companies are also interested in bringing smart watches to market. Samsung, one of Apple's largest smartphone competitors, may also be working on one, if rumored leaks are to be believed. Lunatik debuted as a Kickstarter project in 2010; the company provides iPod Nano owners with a mount and strap to change their device into a watch for $20 to $50. Pebble, also once a Kickstarter, is a $150 smart watch compatible with iPhones and Android that contains a few of its own apps, but is mostly supported by Bluetooth technology. The eerily Apple-esque i'm Watch from Italy has similar abilities as smartphones, with built-in speakers and a microphone; all information is stored in the "i'm Cloud." With all that hardware, the design is bulky and costs about $400. Wearable technology seems to be a rising trend, most notably with Google reaching out to the public for ideas for its Glass project. ABI Research estimates that by 2018 — just five years from now — sales of wearable computing devices will hit 485 million units, NPR's Steve Henn notes. "But smart devices on your eyes or your wrist aren't the only changes in store," Steve says. "A startup called Sonitus could replace your ear buds and Bluetooth cyborg accessory with a device you slip over your molars. It uses bone conduction in your head to transmit sound. Google filed a patent to use bone conduction in connection with Google Glass." Pretty soon, carrying around a smartphone will be so old school. Lizzy Duffy is an intern on NPR's Social Media Desk.